As longtime residents of West Linn and homeowners on Chestnut Street above I-205, Steve and Sharla Alexander considered themselves well-informed about the Oregon Department of Transportation's plans to widen the freeway, but when they recently received notice about a possible sound wall along sections of the newly expanded freeway, they were dismayed. For one, they didn't think the freeway noise was that bad. The couple also is concerned about visual blight and property values. 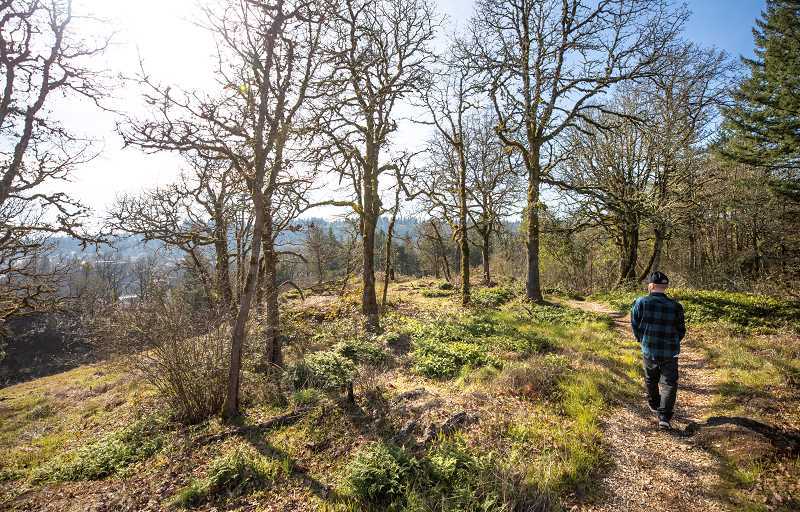 But rising to the top was their concern about the wildlife that use the wooded areas around their neighborhood — including nearby Camassia Nature Preserve — as a corridor between the Willamette River and Wilderness Park deep in West Linn. "Where will they go when the wall goes up?" Steve Alexander asked. "This is about so much more than sound." ODOT is not proposing sound walls for West Linn, but letting homeowners know that it is a viable option if desired. According to Steve Drahota, vice president of HDR — a civil engineering firm serving as consultant for the project — ODOT cannot advocate for or against a wall, but is mandated by federal rules to offer them as a choice in front of homes where the roadwork is expected to raise noise levels more than 5 decibels (ODOT says that the average human ear cannot determine a difference in noise if the change is less than 3 decibels). 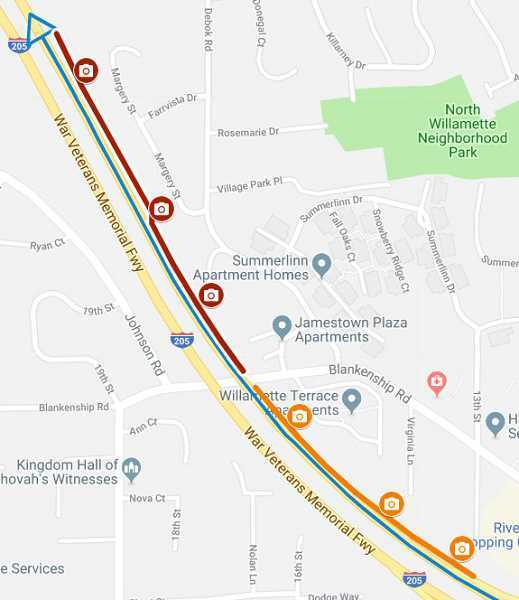 Thus, not all homeowners along I-205 are receiving notices about the sound wall because only "benefited receivers (who could anticipate noise levels at 65 and above with the widening and would receive a drop of 5 decibels with a wall) can vote to approve or reject a wall. This possession of what Alexander calls a "golden ticket" rankles some who feel the walls impact the city as a whole, both visually and in terms of natural space and wildlife. When Alexander asked which neighbors on Chestnut were notified of the vote at an informational meeting March 5, HDR representatives said all the dwellings on Chestnut were considered "benefited receivers" and should have received notice. "I knocked on the doors of all my neighbors and only five got notices," Alexander said. He also attended another informational meeting March 6, at the Adult Community Center, and said only he and one other person in attendance were "benefited receivers." ODOT personnel said they would look into whether the correct property owners were notified. 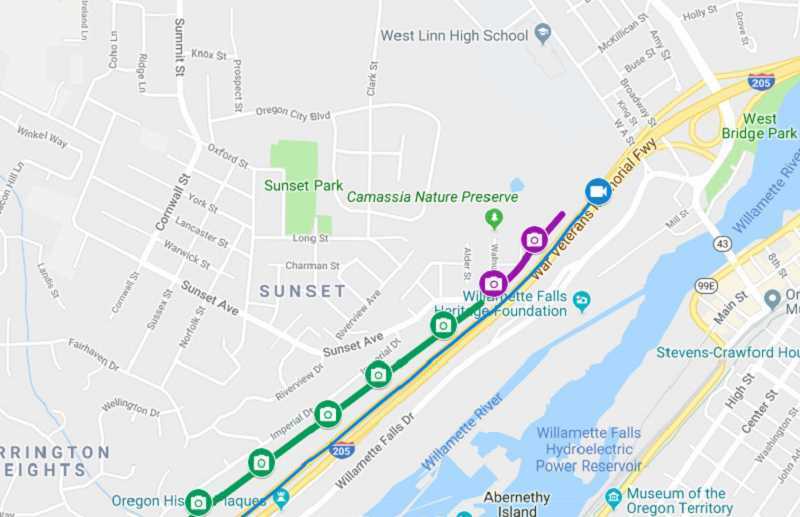 Majority rules in the sound wall decision, and the vote is broken up into four sections from the Camassia area east of Sunset Avenue to Johnson Road — with a large swath near Barrington Heights and Salamo Road not included. The vote won't count unless at least 50 percent of the "benefited receivers" return ballots. Wall construction would not begin until 2021 at the earliest. 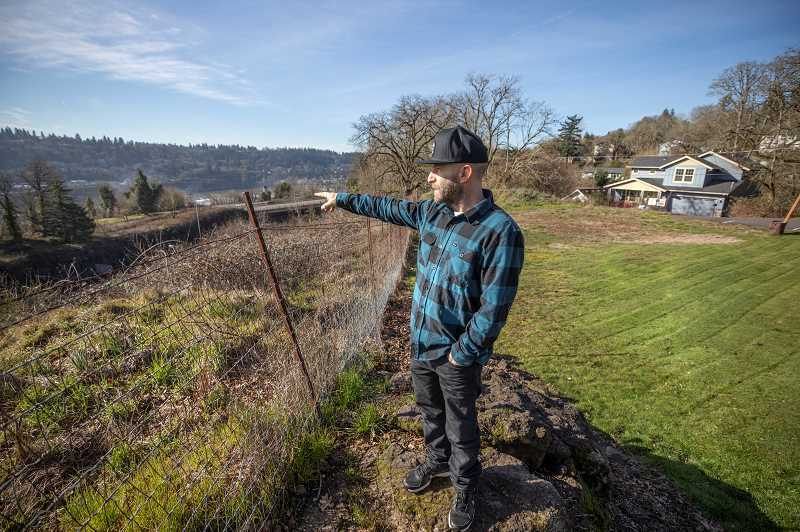 According to ODOT, many of the homes along the I-205 corridor were not deemed significantly impacted by freeway noise — as determined by computer simulations and noise measurements taken on site — to the level ascribed by federal regulations. 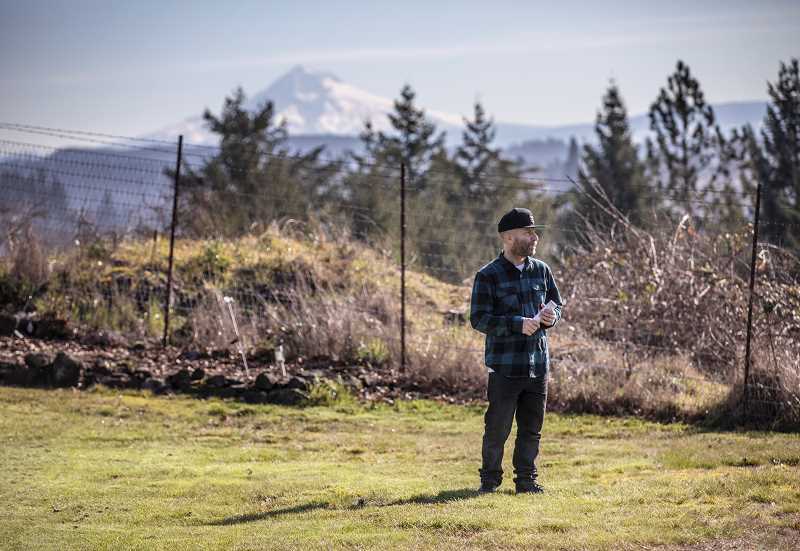 Alexander also shared with officials his concern that a wall would provide an attractive haven for homeless campers and asked what responsibility ODOT held for that outcome but said he did not receive a reply. "In my neighborhood, we're already concerned about cleanup of the old mill and keeping people out of there," he said. "There's so much more going on in this area than people realize." He added that while ODOT told him homeless camping was not a problem along sound walls, he's spoken with people who live by the I-205 wall in Southeast Portland and has been told homeless camping has been a major issue, with neither ODOT nor local police dealing with it. Several attendees at the March 5 meeting asked about adding rows of trees rather than a sound wall and were told rules don't allow ODOT to consider trees a viable option to battle sound, but they could request trees and other landscaping in lieu of a wall, for aesthetics. While there was confusion at the community meetings about whether ODOT did sound readings on location to determine the "benefited receiver" households, ODOT spokesman Don Hamilton reiterated after the meetings that both computer simulations (to project what the sound was expected to be after widening) and in-person readings for today's levels were used. Alexander has serious doubt about the information used to bring the idea of walls forward. He borrowed a sound meter from an aquaintance and measured freeway noise from his yard during rush hour (59 decibels) and from the freeway overpass at Sunset (76 decibels). He says he was told the measurement taken by ODOT at his house was 69. He's asked ODOT to see the documentation but has not heard back.